Inquire about SMCHS, Schedule a Tour, Sign Up for a Shadow Day and Apply Now! Make your gift today because your participation makes a difference! Let's all stand up together in support of our students, our teachers and our school. Applications are being accepted for grades 9, 10, and 11. 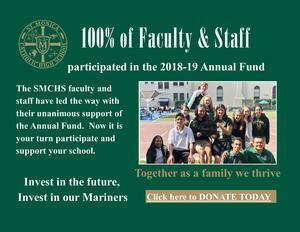 Learn all that St. Monica has to offer in faith, academics, athletics, performing arts and our many clubs and organizations. 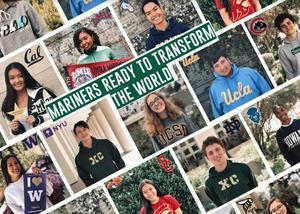 Be part of the Mariner family! Apply Now! Congratulations to Ms. Kate Janson, Director and Chair of the Visual and Performing Arts Department, and her partner, John Capo, 2018 winners of the Dancing with OUR Stars Mirror Ball Trophy! Congratulations to all of the wonderful dancers and the many contributors to this great community event! is in its final week of rehearsals. We are so proud of the cast and crew! This Hysterical Holiday Show is perfect for the whole family! Preview Dinner is November 10, with Opening Night on November 11. Make a date to join us for a show November 11, 12, 18, 19 at 7pm and 2pm on Saturday, November 19. Tickets are available online or at the door.